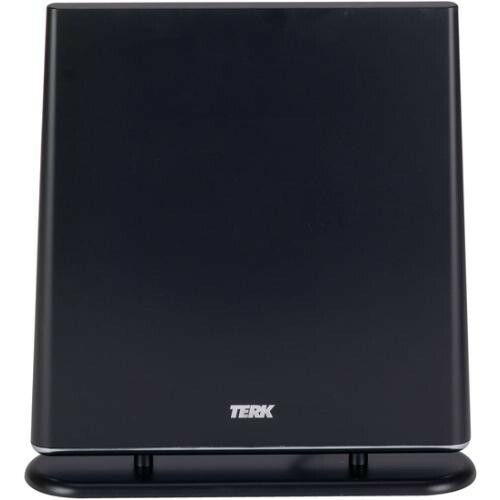 If you're having trouble getting good over-the-air reception from your HDTV or converter box, the Terk Technologies FDTV1A Flat Digital Omni Directional Amplified Indoor Antenna (Black) just may be the accessory you need. The flat, digital antenna employs a high gain design to pick up more distant stations, and its 360° reception pattern means you won't have to keep making adjustments to receive your local channels. The antenna has an Extremely Low Noise (ELN) amplifier for outstanding digital TV reception without signal saturation. But you can remove the amp if signal strength is not a problem in your area. The attractive black antenna is designed to blend in with your existing TV gear, and comes with a 3-way mounting bracket so that it can be used hanging, standing, or lying flat. With the FDTV1A Antenna, you'll soon be enjoying excellent reception of your favorite local digital channels. Box Dimensions (LxWxH) 13.6 x 13.5 x 3.7"
FDTV1A Flat Digital Omni Directional Amplified Indoor Antenna (Black) is rated 3.9 out of 5 by 49. Rated 5 out of 5 by Mark from Excellent Indoor Antenna for the Money This indoor antenna works best placed in a window. So if you have a window ledge it will work best there. I found that if you will place the antenna on top of a thin stable box in the window ledge it works the best. A little height gives you the best reception. After placing the antenna on top of a stable box in the window ledge scan the channels again to see if you get all that are available. If you need to move the antenna to the left or right do so only slightly until you find the sweet spot to get all channels perfectly. After I got the antenna on top of a slim box inside the window ledge all my 27 channels come in perfectly. Rated 5 out of 5 by Markus124 from Turned OFF my Cable - Great Product I bought this antenna to use with the Samsung UN46D7000 digital tv. I was tired of paying for basic cable when I can get the same or more channels for free. Every situation is different but I had to put the antenna in the window sill next to the window and stood it on top of a small box to give the antenna some height. After I did this the antenna pulled in about 27 channels clearly. You may also have to move the antenna to the left or right to find that sweet spot where all channels come in clearly but once you find this spot you should not have to move it anymore. Remember if you are moving the antenna trying to find the spot, rescan your channels to update the tv. Rated 4 out of 5 by Tom of I. from Very Happy I read so many bad reviews of various digital antennas, I wasn't sure if any of them would work, but this was listed at almost half the price I had seen it elsewhere, so I thought it was worth the risk. It works great! My reception is better than it's ever been, and I even got some new channels. I live in the city, so you may need something more powerful for remote areas, but for me this is perfect. The only minor issue is the screws for the base are small and difficult to fit in their slots, but after 15 mins of fiddling around I did it, and now I'm very happy with my purchase. Rated 1 out of 5 by Samson from Terk FDTV1A HDTV Indoor Antennae. DOA This product was ordered with great expectation and good on line reviews. But mine arrived DOA. I had Sony guide me through a complete system rescan and check to try to get the antennae to function but Sony said NO signal. So I called the TERK Tech Support Hot Line as instructed on their instructions. An excellent Technician guided me through a check list and then had me touch the amplifier box and when I said room temp he gave me an address to return it so they could provide a working amplifier. I am waiting with great expectation. BUT be warned you may get a dead one also. Rated 5 out of 5 by sarabee from Easy set-up, works perfectly I didn't know getting the major networks could be so easy. After getting so tired of paying $/mo for cable every month that I never watched, I cancelled my cable and got this so that I could watch breaking news. I have it placed in front of a window with an open view and it works perfectly -- I get NBC, CBS, Fox, and ABC, the only stations I really care about. Super easy to set up, clear reception and an unbeatable deal compared to shelling out so much for unused cable every month. I was duly warned that HDTV antennaes are fickle and every apartment is different, but luckily I found this on the first try. Highly recommend. Rated 5 out of 5 by Tracy from new york from Great Antenna, nice design, and it WORKS Just got this new antenna, have to say its great!! we wanted to get rid of our rabbit ears antenna, and this one was the perfect replacement. With our rabbit ears we got 21 channels, with terk antenna we got 27 channels.....NICE !!!! Rated 1 out of 5 by Anonymous from Didn't do the job. Tried using it in Woodhaven, Queens in a second floor bedroom. I can only pick up channels 7 and 13 consistently, and 4&5 intermittently if a fiddle with the aim. All of this with the unit standing up. It was useless if lying flat. Rated 4 out of 5 by The Mid Night Flyer from Nice Purchase Works well. Receives local stations and other digital TV broadcasts in the NYC area with excellent receptions. At times reception can be a bit spotty, depending on the time of day, weather, cloud coverage with only certain channels. For the most part there are no issues. I would recommend this product if you have an obstruted view from your window. I am on the 6ht floor on the out skirts of the UWS of Manhattan, my apt faces the inner courtyard and the buildings in the area are basically the same height. Even on rainy days I have decent reception. I reach 20 miles to a 30 kw tv station. occasionally a get a glitch or two.